MarketSaw - 3D Movies, Gaming and Technology: Rumor Mill: Dark Smaug On The Horizon Plus Further Word That THE HOBBIT Will Be In 3 Parts -AND- 3D!! Jim here. Got some interesting HOBBIT news for you. The information I am sharing is from one of my most trusted sources and so you can rely quite a bit on it despite being very early in the production of THE HOBBIT(s). 1. THE HOBBIT(s) will be in stereoscopic 3D. 2. THE HOBBIT will be shot in THREE movies - two Del Toro movies covering the book itself and a third bridge movie. 3. Peter Jackson will direct the bridge movie. 4. Smaug and the characters in THE HOBBIT will be darker than in the book. 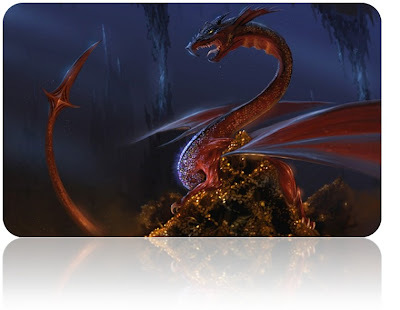 "Smaug will be a mixture of practical and animation ...going purely on practical, the design rocks. I think THE HOBBIT may be a different beast to the book, at least in terms of going darker. And judging from Smaug "and the Gollum tweaks" will be something to rival the previous attempts at the very least. It is still very lock and key at the moment. I can tell you this, Peter Jackson is very keen to have the two part Hobbit tale set in 3D. Del Toro however is holding back on that school of thought. At least for the time being. Im hearing word "and its only speculation at the moment", that it wont be two films. It will be three. The two parts and the bridge movie. Word alone is not trustworthy. However I hear this from lots of people. And have seen things to indicate this may be the way it is heading. Del Toro on Hobbit duty, Jackson on the bridge project. Time will tell." I am completely thrilled about the possibilities! I have been hoping for this eventuality ever since I exclusively posted that PJ's lawsuit was being dropped and that he would indeed be coming back to the project. To me it just makes sense. Del Toro has a grasp on THE HOBBIT from a literary perspective and is a good choice for the first two, but who better than Jackson himself to connect THE HOBBIT to his LOTR trilogy? All in 3D! I am a little worried that Del Toro will not shoot in 3D for some obscure reason, but confident that Jackson will bring him on board. Any bridge movie would definitely be in 3D though I am sure as Jackson would be helming it. Keep it on MarketSaw for the best 3D coverage anywhere on the planet. Photo courtesy of Raymond Gaustadnes.